It’s been a minute. Nice to see you again. Hi, it’s us! We survived 2018 and look forward to thriving in 2019. I confess that I am a maker of New Year's Resolutions. There's no use denying it or hiding from it. January happens to be my birthday month, so when the holiday season is over and we tick into a new year, I get caught up in fresh starts, goal setting, and feeling remarkably springy about the year to come. Sometimes my resolutions last, sometimes they don't, but it always feels good to me to approach the beginning of the year with mindfulness and a hopeful outlook. Chris, on the other hand, rarely makes formal resolutions. He'd rather not be disappointed when the resolve fades away, so his answer is to live his best life everyday. Our differences make our life partnership stronger and we are better people when we listen to and learn from each other. Private and public events made such a difference to us in 2018. Thank you for sharing your lives with us! The arrival of 2019 marks the third year of partnering together in business as well as in life. We took some days between Christmas and New Years to reflect on 2018 and plan for the year ahead in both lofty (my approach) and measured (Chris' approach) ways. Surprised and delighted with how well the events side of our business performed last year (thank you all! ), we committed to a year in which we would work to create similar enthusiasm, joy, and community in the shared kitchen side of our business. Orange Door Kitchen may not be the biggest or most sophisticated shared kitchen in the region, but we do stand out from the pack because we operate a sparklingly clean and cheerful kitchen that is approachable, thoughtful, and a supportive environment for small business growth. 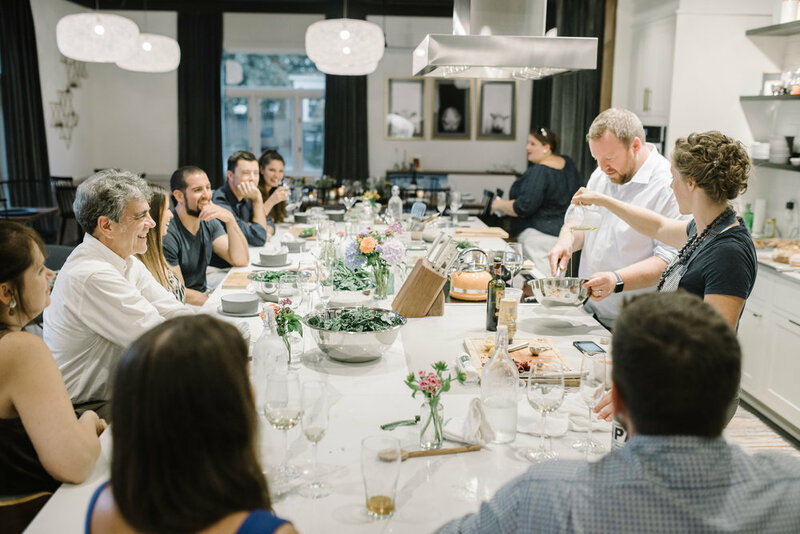 Our facility is the perfect bridge space for that time between a food entrepreneur needing to get out of their home kitchen and then having the capacity to either go into a larger shared kitchen or open their own commercial kitchen. Our shared commercial kitchen is the perfect bridge space for small food businesses to grow out of their home kitchens. We cannot thank you enough for rallying around us in 2018 to help Orange Door Kitchen get off the ground. You came to our events, collaborated with us, rented our space, introduced us to people we should know, followed our adventures on social media, read our newsletter, and spread the word of our existence to your friends and neighbors. We hope that you'll continue to do all of that and just a bit more to help us grow our shared kitchen community. Is someone you know thinking about starting a food business? Tell him about our upcoming shared kitchen open house. Do you have a friend who knows a personal chef who is looking to grow her drop-off meal business? Send her a link to our website. Do you enjoy chatting with vendors at your local farmers market? Ask them if they're happy with where they're producing their food and, if not, tell them about Orange Door Kitchen. You may not think that you're connected to anyone who needs our space, but you may know someone who knows someone (who knows Kevin Bacon...just kidding). In broad strokes, any food that's sold in the state of Massachusetts must be produced in a licensed commercial kitchen. We built a really nice one in West Acton and are excited to share it with a community of food entrepreneurs looking to grow their businesses!